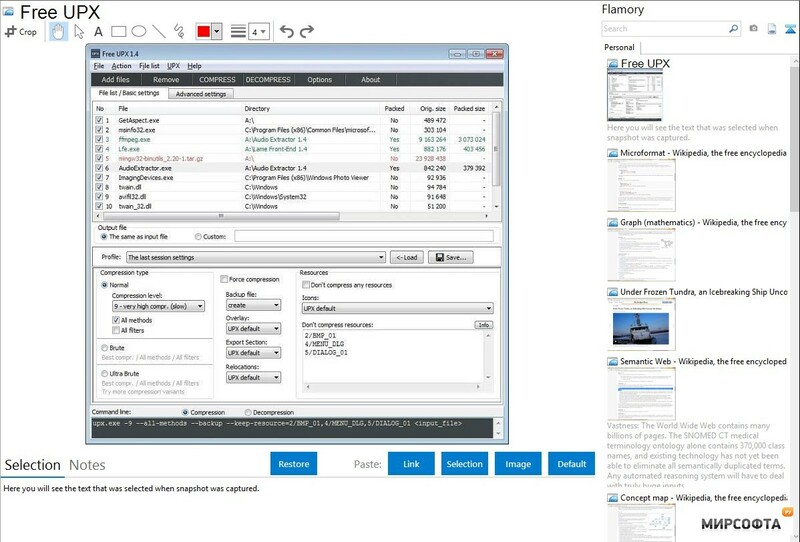 Free UPX is an easy-to-use graphical interface designed for the UPX (Ultimate Packer for eXecutables). You will have the power to easily and quickly compress/decompress Windows executable files (EXE, DLL, OCX, BPL, CPL, SYS, AX, ACM, DRV, TLB and others). You will be permitted access to all UPX parameters without having to resort to the command line which is useful for novice users that are not comfortable using that option. Free UPX does offer a few customization features like shell integration and some color scheme options, but what it lacks in fancy colors, etc., it makes up for with functionality and ease of use. Easy access to all UPX command-line parameters. Displays detailed information about compressed files: original file size, compression ratio, saved space, compression level and other. Portability. Free UPX does not use the system registry, and all settings are stored in an INI file so that it can be run from portable drives.